David’s retired as a full-time Director of Hobbs Parker Property Consultants LLP and Head of our Planning Consultancy at the end of 2015. David currently works part-time in a consultancy role looking after some of our long-standing clients. David’s areas of expertise include preparation and submission of planning applications, development appraisals, development briefs, planning appeals, representations on Local Plans/Local Development Frameworks/Structure Plans/Regional Plans, applications for listed building consent and conservation area consent, environmental impact assessment and specialist advice on interpretation of planning permissions, planning conditions and Section 106 agreements. David studied Town and Country Planning at Trent Polytechnic Nottingham, and worked for 10 years in Local Authorities in the West Midlands and Kent. He obtained an MA in Management from the University of Kent in 1987. He has been a Partner in his own professional practice since 1988, based in Canterbury, providing professional advice to clients throughout the South East of England, and further afield. In addition to his professional practice, David has taught Planning Law at London South Bank University and Canterbury School of Architecture, and Environmental Management at the University of Kent. 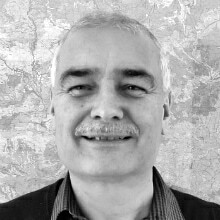 David has chaired the South East Branch of the Royal Town Planning Institute and represented the Branch on the National Council and represents the Institute on the Canterbury Conservation Advisory Committee. David was born in London, and has lived in Kent since 1980. He is married with one daughter. His interests include music (currently learning the guitar and music theory), and modern languages (he speaks Spanish and retains a rusty knowledge of French and Japanese). His other interests include reading, classic cars and golf.